A stylish way to display your air plants. Be part of the houseplant revival with these low maintenance plants. Easy to grow - perfect for first time plant owners or anyone new to gardening. Perfect for any situation - decorate your home or office, the pots will sit anywhere! Long-lived plants will add a touch of natural charm to any room. 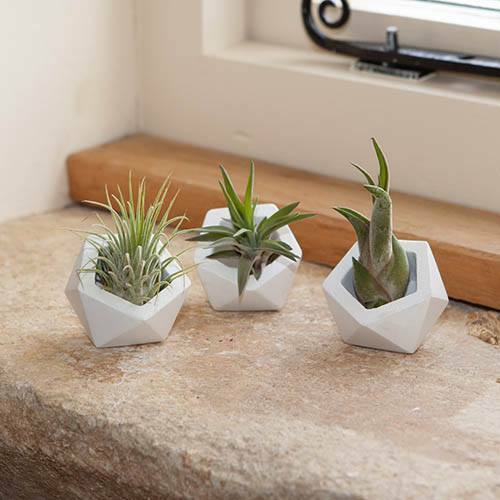 Supplied as a set of 3 small geometric planters with airplants included. Air plants are one of the current must-have indoor plants, and everyone seems to have them on their wish list! These multipurpose plants are suitable as decorative houseplants for any style of home - plus air plants have the added bonus of being able to help clean the air in your home by helping filter out impurities. This is the ideal way to treat yourself to a unique gift. Suitable for any occasion or as a gift for yourself, we are confident you’ll love your air plant! This kit is a contemporary way to display your air plant - a set of stylish, geometric pots with air plants included. Featuring a set of three white ceramic pots, this perfect, easy-care, low-maintenance houseplant kit will be delivered direct to your door in perfect condition ready for you to display. The air plants included are top quality, healthy, nursery grown plants and will be delivered direct to your door in perfect condition. Supplied as 3 geometric pots with airplants includes. Pots are approx 5 x 5 x 5 cm. Total height including plants approx 8cm. The perfect low-maintenance houseplant, these air plants really do not require much attention at all, making them the perfect choice for adding a bit of life to a room but with very little effort.